Rug wools were originally available in skeins or balls that had to cut into strands at home. Even into the ready-cut era of rug wool, many latch-hookers cut their own strands from balls or skeins of yarn. It was usually cheaper to buy uncut yarn, especially when buying in bulk (one of my inherited projects came with a bale of skeins). Some shades were not available in ready-cut packs, plus many people recycled old knitting yarn from knitwear or crochet into rugs. 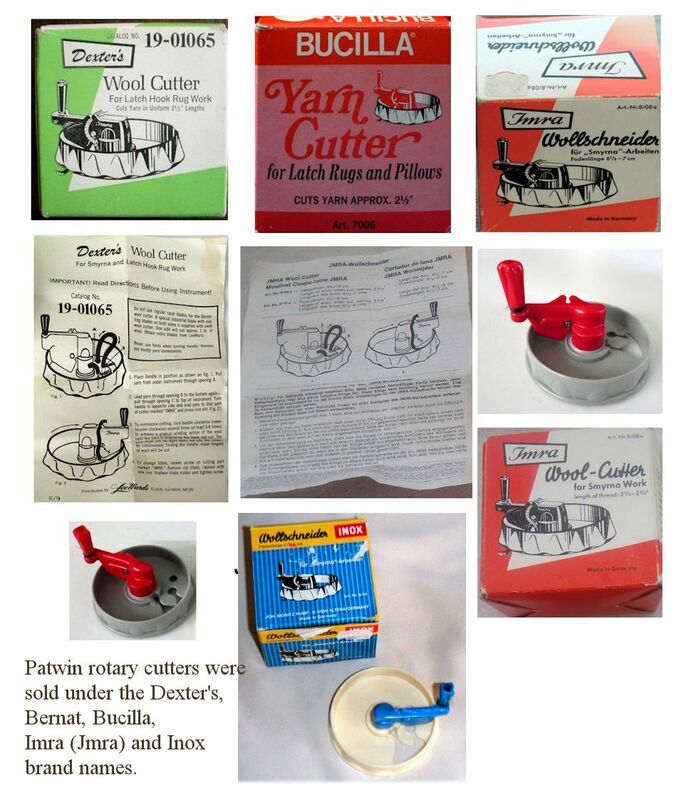 From the 1950s, the heyday of home latch-hooking, rotary cutters were sold. 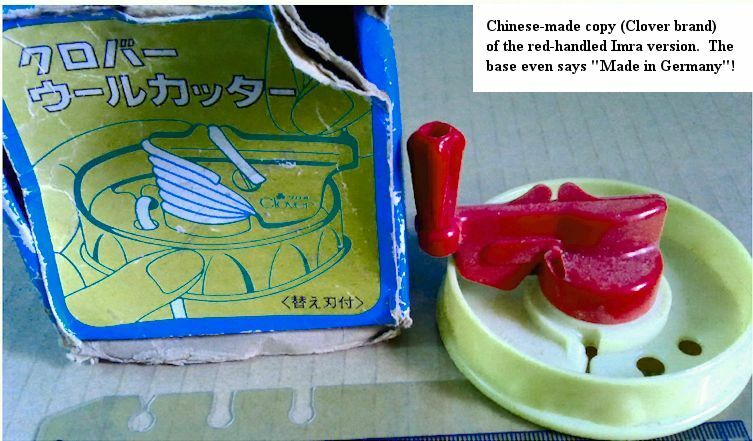 These were made of Bakelite and were the same basic design of a base section, a winding handle and a razor blade (the two-edged, non-safety razor sort). With a choice of feed holes, they cut strands to either 2.5 (6.35 cm) inches or 2.75 inches (6.9 cm) in length. Personally I found these fiddly to use compared to the wooden cutting guide, but those who use the rotary cutters mention the uniformity of length of the strands and the flat surface they produce on a rug compared to scissor-cut wool. 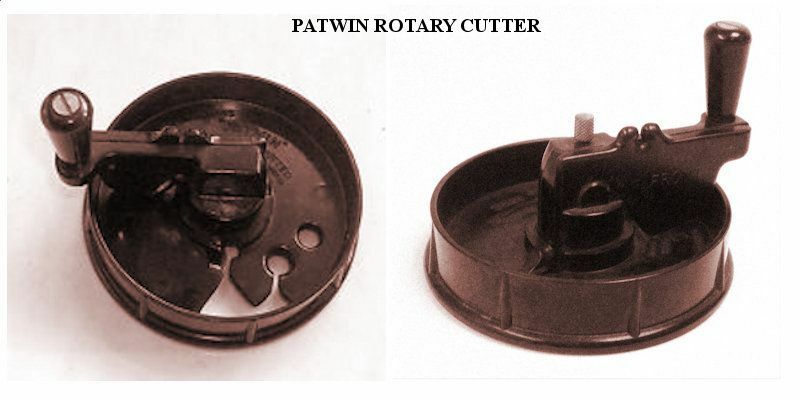 Paton and Baldwin's Patwin Turkey wool cutter was widely available in Britain and was made of black Bakelite (an early thermosetting plastic). 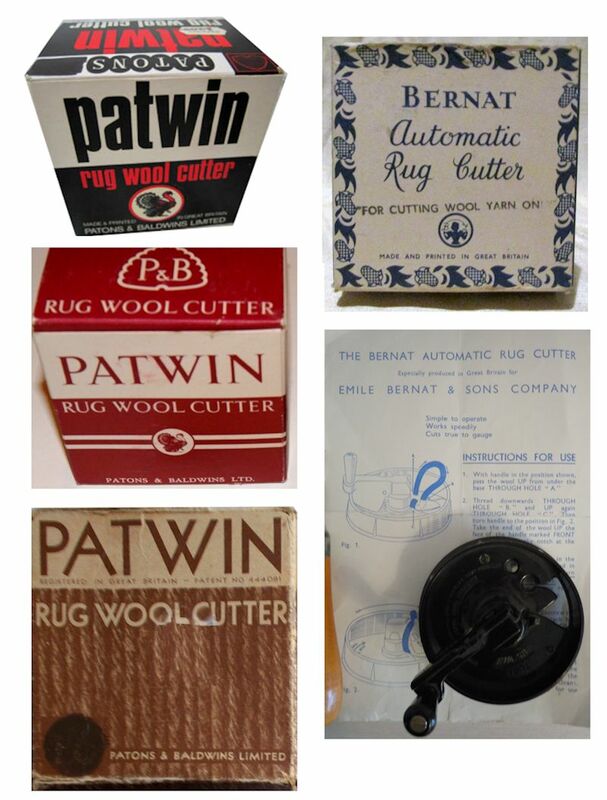 Several rug supply companies recommended the Patwin wool cutter for use with their yarns, for example Stoddarts. 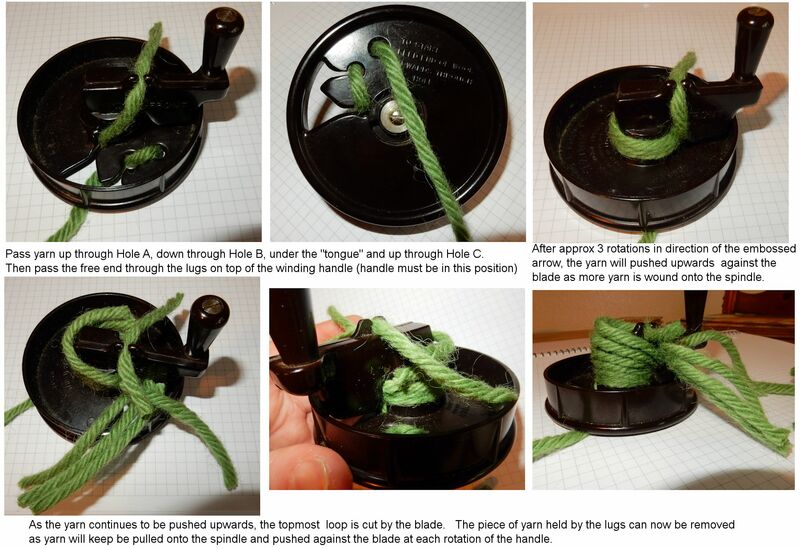 The Patwin Bakelite Rug Wool Cutter was invented by Joseph Percy Wilks (not "Wilkes")of Uttoxeter, Staffordshire and covered by British Patent No 444081. 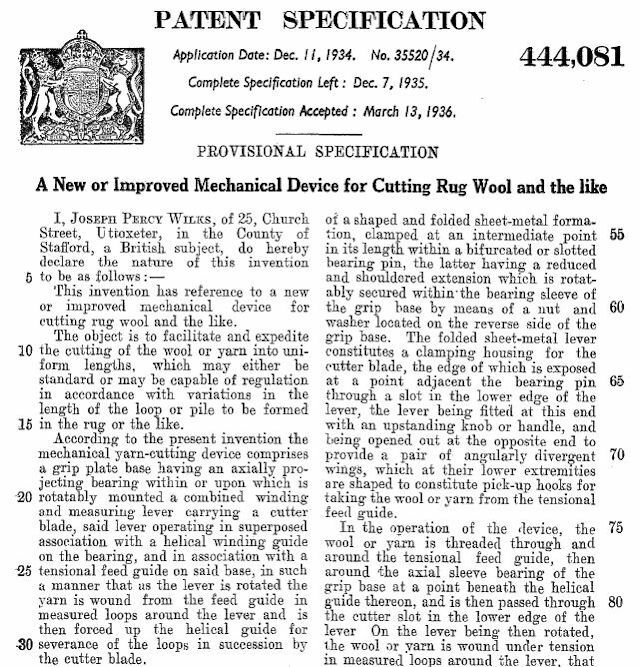 Wilks submitted his patent application in 1934 and described his invention as a "new or improved mechanical device for cutting rug wool and the like." His patent was published in 1936. It was licensed to Patons & Baldwin who marketed it under their Patwin brand name. It was also sold (hopefully under licence!) by several other companies in Europe and North America. The Chinese(?) version sold in parts of Asia looks like a cheaply made copy. 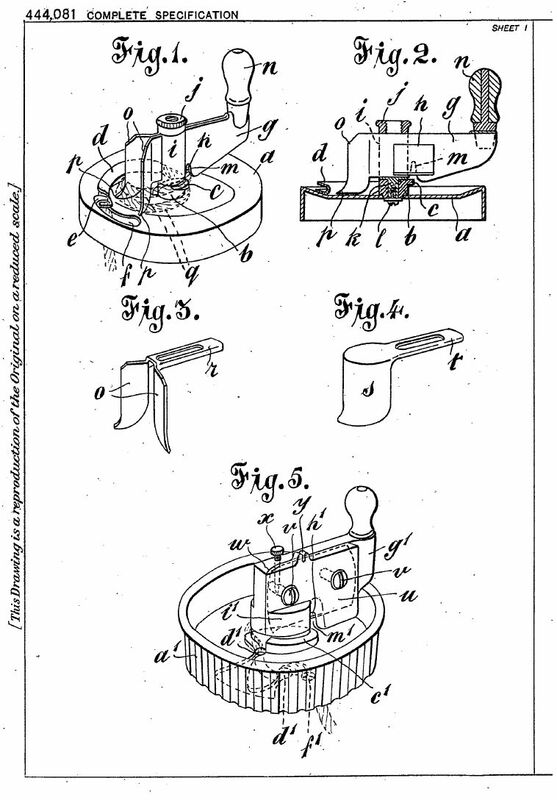 This is how Wilks’ patent application described the cutter. 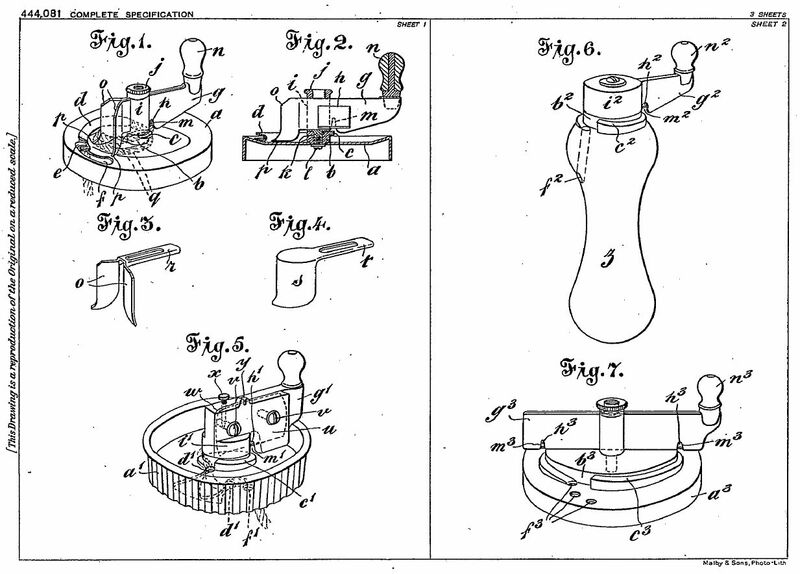 Here are a couple of images from the patent, depicting the design and operation. 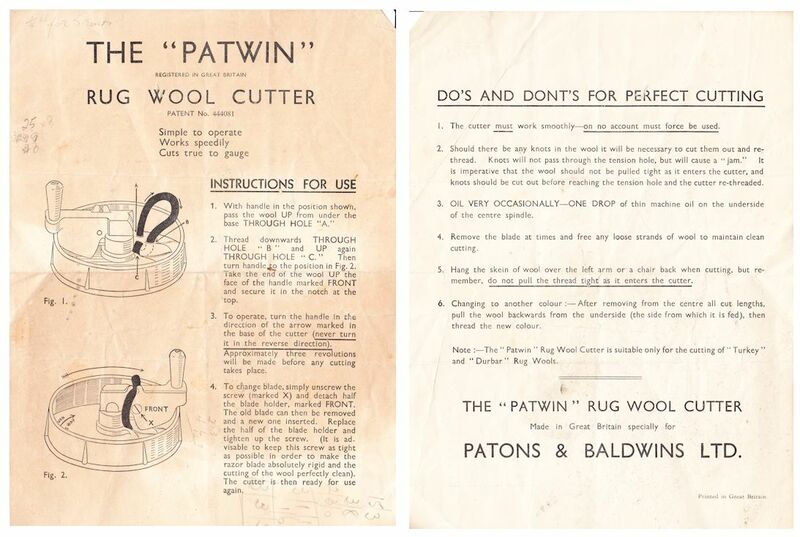 Patwin cutting tool instruction sheet. 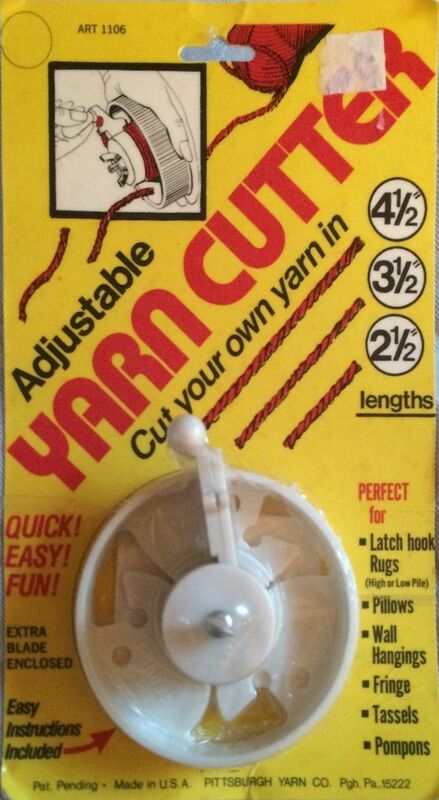 This version of a rotary cutter (from Pittsburgh Yarn Co) can cut different lengths of yarn by fitting sleeves over the spindle and clamping them in place with a wing-nut. There are 3 sets of holes, variable distances from the spindle to accommodate the different diameters. It's not actually necessary to have 3 sets of holes, the 2 closer sets aren't required as only the topmost wound loop is cut each time! Black bakelite cutter made in the UK. Distributed under the Patwin brand in the UK by Patons and Baldwin (Patwin) and in North America by Emile Bernat and Sons (presumably made for them by Patwin who appeared to hold the licence). The Imra cutter "for Smyrna Work" was produced in West Germany. It was sold under the Imra name and was also re-boxed for a number of companies to sell under their own name. The "Imra" logo can be found on the red winding mechanism. These cutters were made of white Bakelite with a red spindle and winding handle. This version was distributed in North America under the Bucilla and Dexter's brands. Dexter's description on the packaging says ...."cutting of the wool threads becomes easier, faster and more economical. A plain surface of the rug is guaranteed and cutting with scissors is not needed." The two-sided blade was supposed to cut approximately 1 lb. of wool per side. The Dexter’s Wool Cutter was distributed by LeeWards of Elgin, Illinois, USA and came with a warning to use only the special double-sided blades and not ordinary razor blades. A Chinese-made "Clover" branded copy of the West German rug-yarn cutter; this one was on sale in India. It's a cheaper plastic and the tool has several moulding flaws not found on genuine Imra/Jmra/etc versions of cutter. 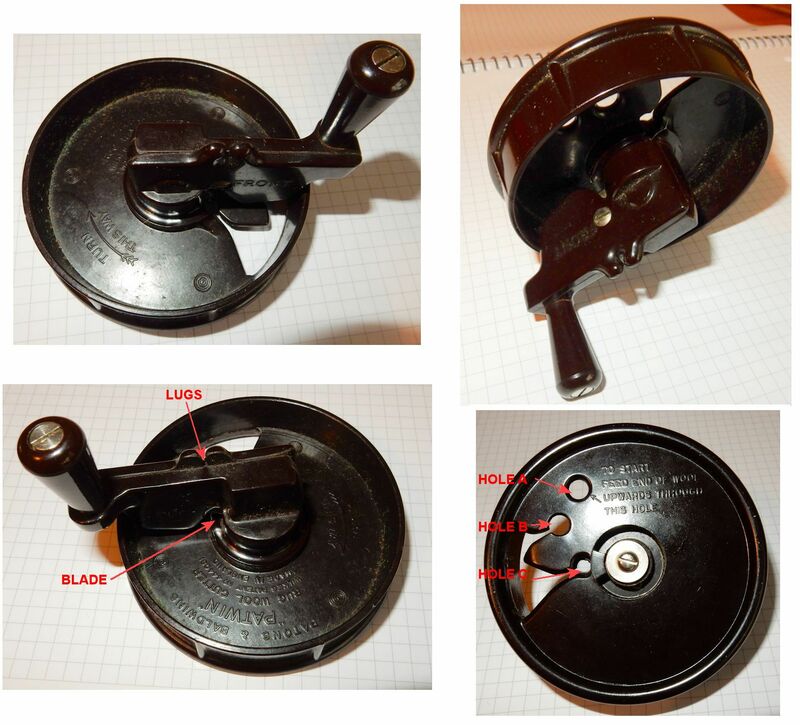 The base says "Made in Germany" which suggests it was copied from a physical cutter, rather than made from the original design document (I'm pretty sure the original patent has expired by now).